Greetings from Pittsburgh where I’m settling this weekend. 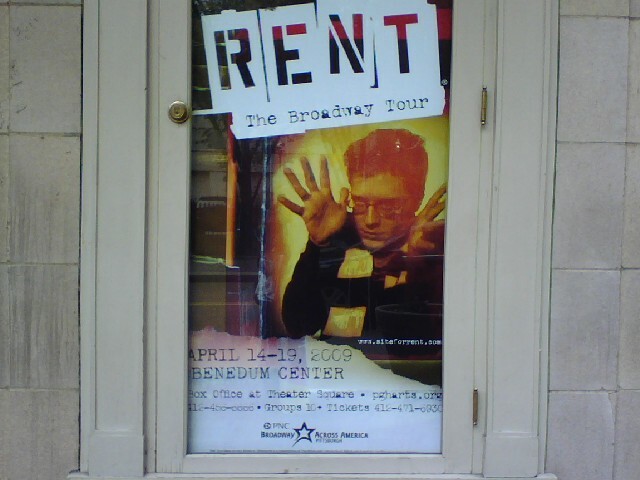 No, I’m not relocating to Pittsburgh, I’m settling the Pittsburgh engagement of the First Class National Tour of RENT, featuring Adam Rapp and Adam Pascal. The gross income for an engagement, including any taxes and facility fees, are called the Gross Box Office Receipts (GBOR). To begin, any taxes and facility fees are deducted from these gross monies. Also all box office commissions come out of the GBOR. The Presenter receives a specific commission percentage for tickets purchased via different points of sale — subscription, groups, internet, box office, etc. (These commissions will cover the ticketing commissions the Presenter must pay to the credit card companies, etc.) All of this information is included on the settlement. From this NAGBOR — the net monies — the Presenter hopes there is enough left to completely cover any payments to the Company (ie: the Guarantee), and all documented expenses and fixed expenses. Documented expenses are the expenses directly related to the engagement and require receipts and back-up, all of which must be given to the Company Manager in time for settlement. Settlement takes place “behind the scenes” during the final performance. The Presenter and the Company Manager are plugging in all the aforementioned data into their respective documents and work toward coming up with equal numbers. Settlement is the final step in the long process that has involved many, many players — producers, booking agents, contract managers, presenters, marketing companies, press agents, operations teams, ticketing managers, and ultimately, yes, the weary settler, who’s hoping she gets out tonight at a decent hour so she doesn’t have to go to sleep at midnight again on the Tap Room’s delicious, but bulky cheeseburger.